Breaking down which high-growth fintech stock offers investors better upside today. The payments market is today in the throes of its most significant disruption in a generation, and recent IPO stocks Square (NYSE:SQ) and PayPal (NASDAQ:PYPL) are both at the epicenter of this sea change. 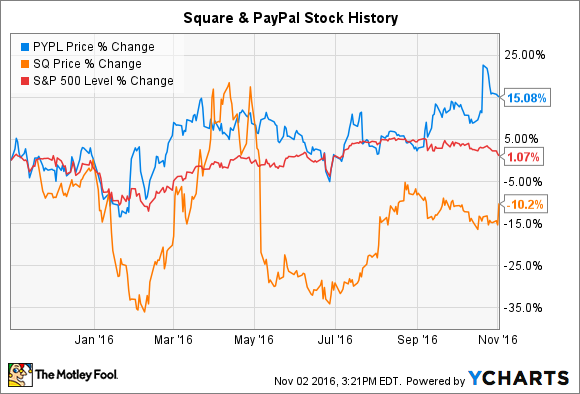 Over the past 12 months, though, investors have treated Square and PayPal shares quite differently. Square and PayPal will take years to achieve their ambitious objectives. So let's delve deeper into the investment outlook for each company's stock to try to determine which mobile-payments company looks like the better company to buy today. As a younger company Square is much earlier in its business plan than PayPal, though that's by no means a bad thing. As I discussed in a recent analysis of Square, the company remains correctly focused on maximizing market share first and foremost, and it's doing so through an increasingly diverse number of channels. Square's traditional core customers have been small businesses in the U.S. to which its primary value proposition has been its turn-key ease of use, providing them with the tools necessary to "start, run, and grow their businesses." The company's small-business ecosystem began as just payment processing but has expanded in the intervening years to also include payroll services, short-term lending, employee management, supplier and customer invoices, analytics, marketing services, and more. Better still, Square combines these core business functions into a single unified software platform. Increasing the number of ways it touches customers' businesses benefits Square in several ways. First, providing a wider range of services to its customers should help bolster customer retention among its current users. Thanks to its increasingly broad swath of business services, Square has also created multiple opportunities to monetize its existing customer base, a double-win if there ever was one. In addition to expanding the breadth of its services, Square has recently started courting larger customers -- defined here as businesses with gross payment volumes exceeding $500,000 annually -- which are generally more stable than smaller companies. Though courting larger businesses comes with some additional expenses, the move also should help Square tap into a more stable customer base. As I mentioned in my earlier piece, Square's lack of profit makes valuing the mobile-payments rising star far more of an art than a science. So rather than trying to value the company, judging the company based on its execution seems like a reasonable way to size up its investment merit. In this vein, Square seems to be making many of the right decisions to position itself for long-term success. The company continues to evolve its product in ways that are useful to its core customers. It's also expanding into new markets, where its services seem likely to prove useful. As such, Square looks like an attractive option for those seeking to invest in the burgeoning mobile-payments space. Like Square, PayPal is a leading provider for a solution at the increasingly popular intersection of financial services and digital transactions. Spun out from longtime parent company eBay last year, PayPal has aggressively grown its business over the past several years. As just one example, PayPal's 2007 revenue totaled $1.9 billion, and its 2016 full-year sales are expected to reach $10.8 billion. Furthermore, PayPal's profitability appears likely to continue to expand in the coming years. As part of the company's recent earnings report, PayPal's management issued an updated three-year business outlook. The move was probably intended to soothe concerns over PayPal's recent deals with Visa and MasterCard, but the ultimate result was a glimpse into a business that's truly coming into its own. According to PayPal's management, the company slightly increased its projected annual sales and free cash flow growth rates to hum along between 16% and 17% over the next three years, a hugely impressive figure given mounting competitive pressure from Apple, Amazon.com, and many others. The company also continues to position itself to succeed by cementing savvy deals with leading digital platforms such as Facebook. In terms of valuation, PayPal currently trades at a seemingly expensive 36 times its last 12 months' earnings. Its forward P/E ratio of 23 makes the mobile-payments giant's shares seem a bit more palatable, and we know the company expects to continue to grow at above-average rates for years to come. Especially when compared with the company's medium-term and long-term growth opportunities, PayPal's stock looks like a fantastic option for patient, long-term investors. I like Square quite a bit, but with apologies to its investors, PayPal's risk-reward profile appears slightly more favorable today, in my estimation. The company's strong profitability and massive growth opportunities make it a hugely attractive option. Its strategy to continue to court and partner with potential competitors signals to me that its management understands how to position itself to succeed, even as the competition in this space continues to accelerate. With respect to Square, the company's value proposition clearly resonates with a traditionally underserved segment of the business world. The company's growth opportunity is similarly massive. What tips the scale between the two companies for me is that PayPal's profit structure today is slightly better defined than Square's. So while Square remains an appealing way to invest in the long-term growth story in fintech, PayPal looks like the better buy today.